have patience I will do it properly later. And its nice to be able to drive it in the summers and do repairs in the long Swedish winters. 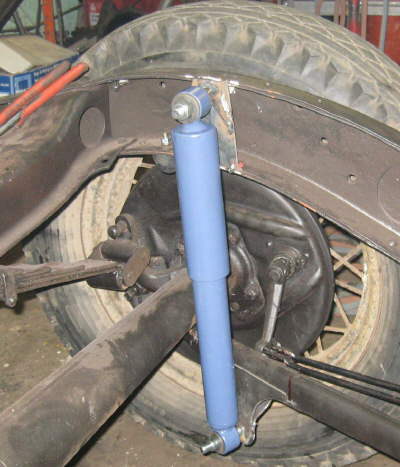 First i only cleaned up the steering column, but later i had to replace the bearings to get it work properly. I cleaned up the firewall with a wire brush on my angle grinder, and there was quite a bit of good old Bondo on it. Check out the "homemade" battery shelf that have been "restored" to original. It was quite common to do this battery shelf modification. A quick masking and some more flat black paint. I sprayed the rear fender wells also to get the same feeling as the rest of the junk. Mikael helped me to lift over the body to the original frame, from the old junk frame i had borrowed. A quick roll out to check out the "new" car. The grandchild's had to test it to. Do you remember the shock mount's? 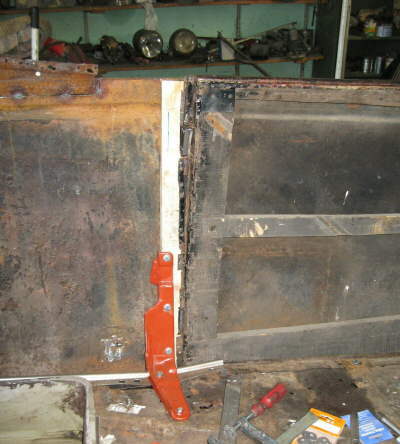 Well they did not work out perfect :-( But instead of adjusting the mount i cut a couple of holes in the rusty floor. Will cover them with some steel later on. And when i do it properly when i repair the floor. Henrik came with his 32 Chassie, so the 33 project halted for a couple of weeks. Back in the garage it was time for the engine startup. First i had to clean up the Lucas Dizzy. it's NOS, but it needed some sanding of the points, to start working. I added a set of original type cables, I mounted one cable at the time. And checking with the Ohm meter after each cable. Last but not least the wire from the coil was added. I hooked up an old oil pressure gauge, for the first startup, of my "renovated" engine. Added a rubber gas line from the fuel pump thru a hole in the firewall. A quick check of the fit of the gas tank, I realized that i had to open it up for a cleanup. I marked for a hole on the top side. 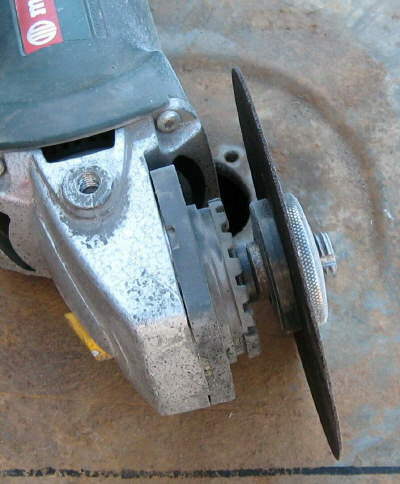 To cut the hole i used a thin disc (1 mm thick). Opening up the tank, showed that it was full of rust. Quick a lot of rust. Even the "lid" was full of rust. Be sure to tuck in the shirt, not harm done this time, but be sure to use proper protection. One hour later it looked better. Cleaned it out with water and let it dry in the sun. There will be more on this later on. I had a bit of the old door post wood, and recreated a new door post. Many hours to get this fit of the door, but it's needs many more hours to get it perfect. but it will do for now. The wood in the door has probably been replaced over the time. Nice work though. As you see there is more work to get the doors to fit in the front. But this will have to wait until the next Webb update.